Lion’s Head Mountain (also known as Shitoushan or 獅頭山) is one of the most underrated attractions in Taiwan. 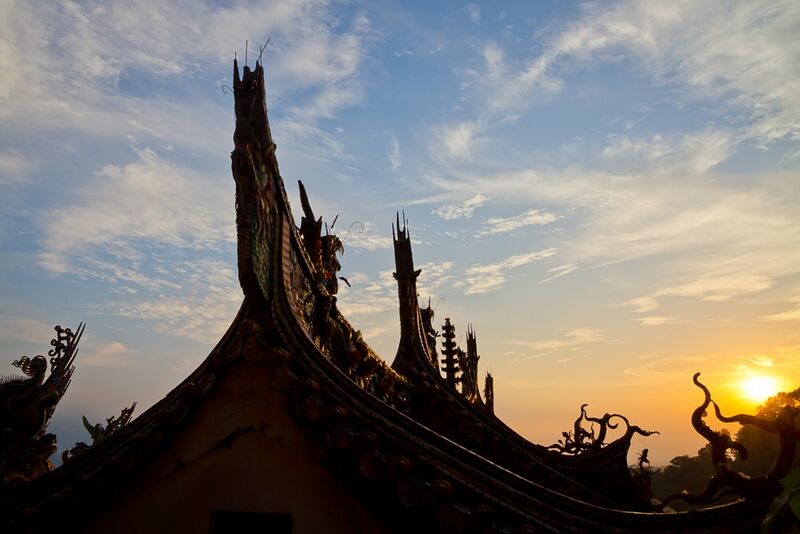 Whether you enjoy hiking, are interested in Taiwan’s Buddhist and folk religious culture, want to spend a night in a temple, or simply want to get off the beaten track in Taiwan, Lion’s Head Mountain should be high on your list. Nearby, the laid-back Hakka village of Nanzhuang (南庄) attracts hoards of local visitors who come to sample Hakka delicacies and flower-flavored treats on Sweet Osmanthus Lane. Nanzhuang is one of four townships in Taiwan that made it onto Italy-based Cittaslow’s list of international “slow living” cities. 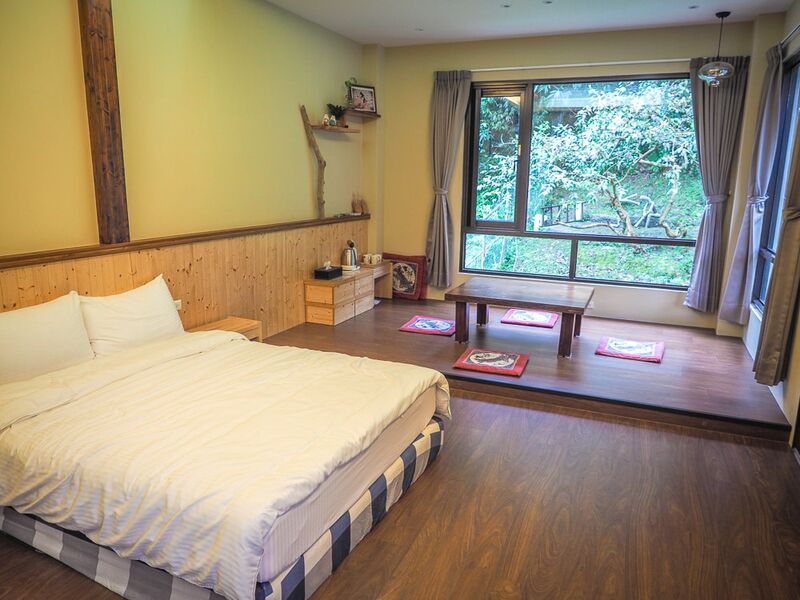 It’s the perfect place to escape hectic city life and kick back in a friendly, family-run local minsu (guesthouse). I’ll recommend some great minsu choices below! Lion’s Head Mountain straddles the Hsinchu and Miaoli border, and hikers can access the mountain’s trails from either side. 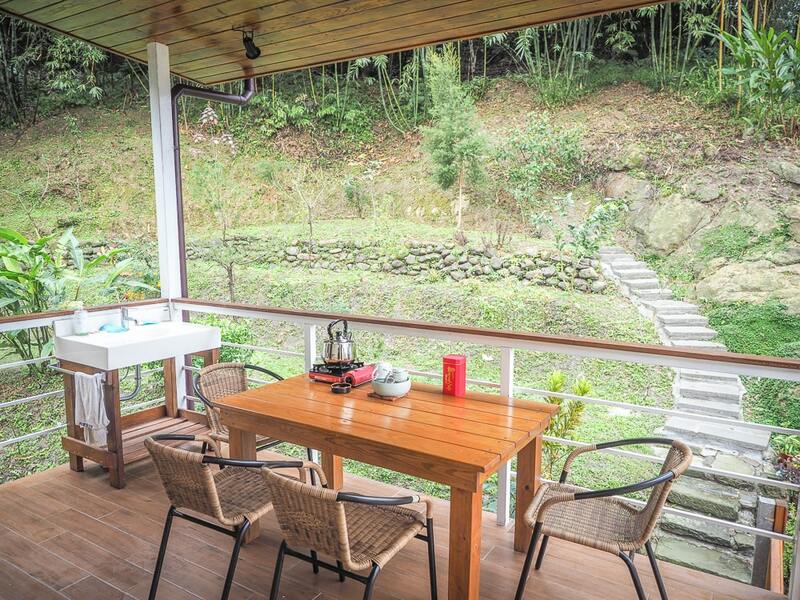 Nanzhuang is a 15-minute drive away from the entrance on the Miaoli side. There are fewer buses accessing the area than there used to be, so see the updated 2019 transportation information at the end of this article. I’ve been to Lion’s Head three times now. 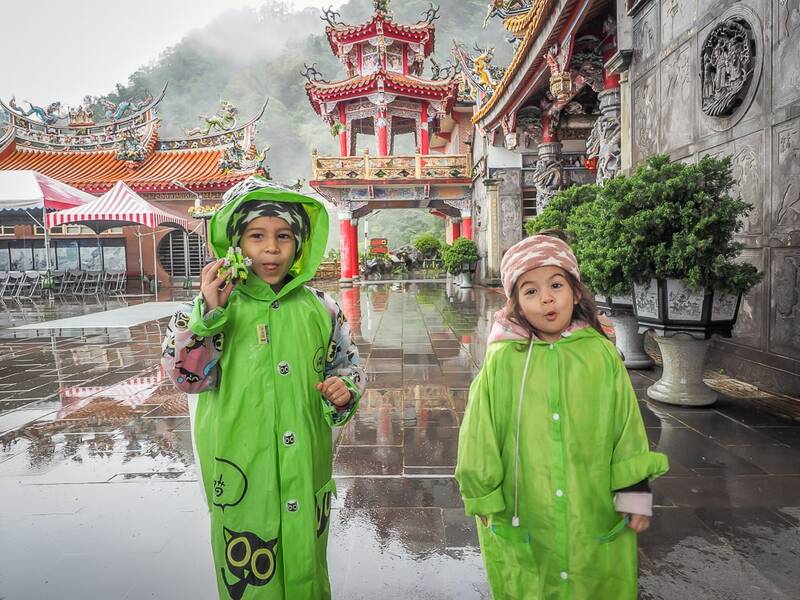 Most recently, I took my two kids there on a super rainy weekend, and we had a great time stomping around the puddles, staying overnight in one of the temples, and waking up to find the mystical landscape shrouded in mist. Who said you can’t go hiking with kids in the rain? 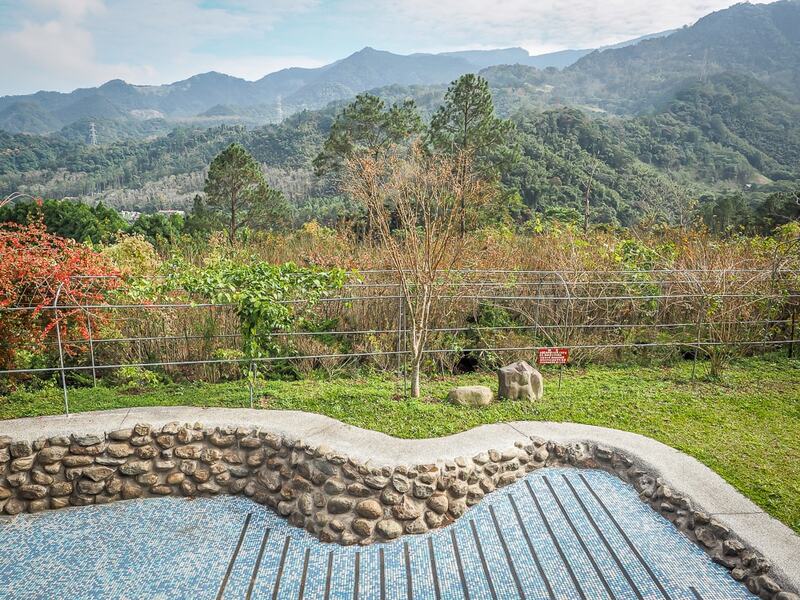 If you’re heading to the area, here are some other ideas for things to do in Miaoli. Lion’s Head Mountain also makes it onto my list of top-50 things to do in Taiwan. At only 492 meters at its highest point, Lion’s Head Mountain is a dwarf by Taiwanese standards. Its slopes are covered in dense, lush forests that are often shrouded in mist and conceal numerous rock walls, caves, and grottos. In 1892, a Buddhist monk from Taoyuan named Pujie (普捷和尚) was exploring the area and found a collection of bones in a cave. He requested the owner of the land to construct a temple to honor the deceased. 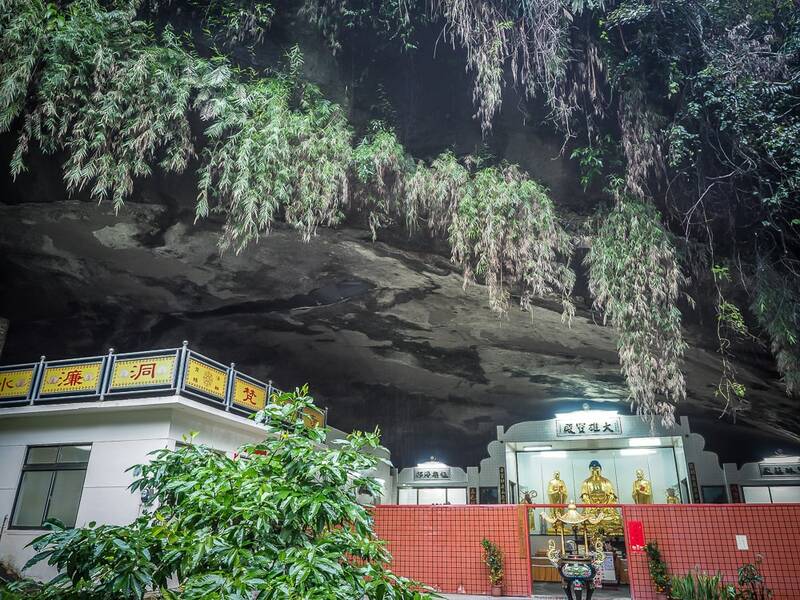 Called Shiyan Dong (獅巖洞 or Lion Cave), it was located near the peak of the mountain, which looks like a lion’s head. 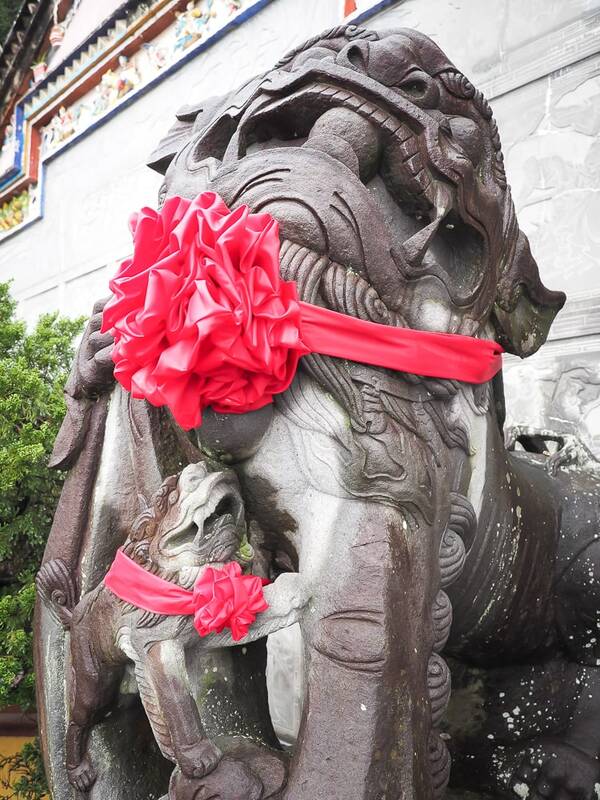 The temple was later renamed Yuanguang Temple (元光寺). Although it has been rebuilt many times, the temple remains today and looks almost new. 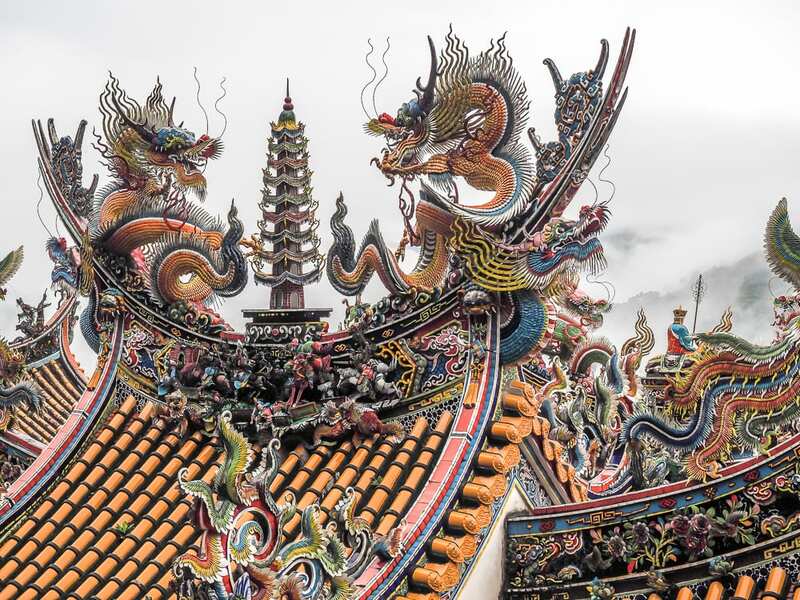 Many more temples soon followed after the construction of Shiyan Dong, including enormous Quanhua Temple (勸化堂) on the Miaoli side. 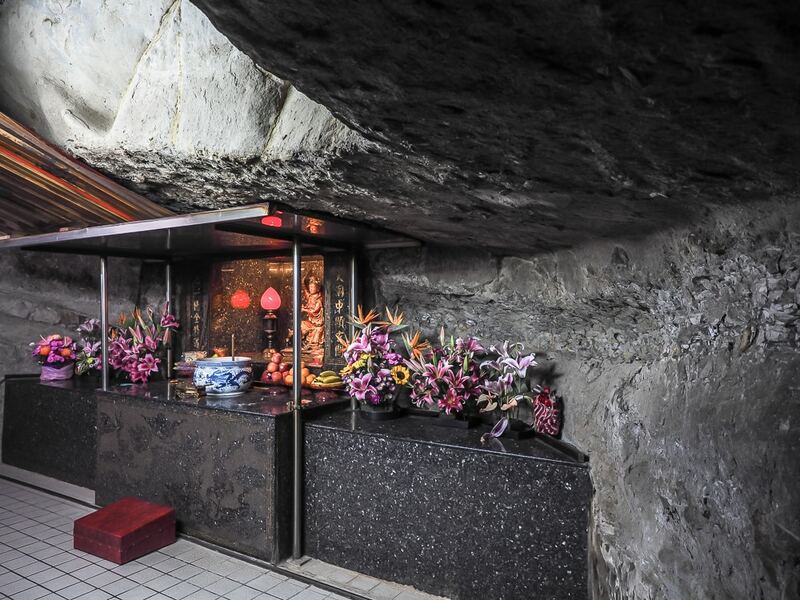 Like Shiyan Dong, many of the 20+ temples were partially constructed in caves, into cliff walls, or below rock overhangs. 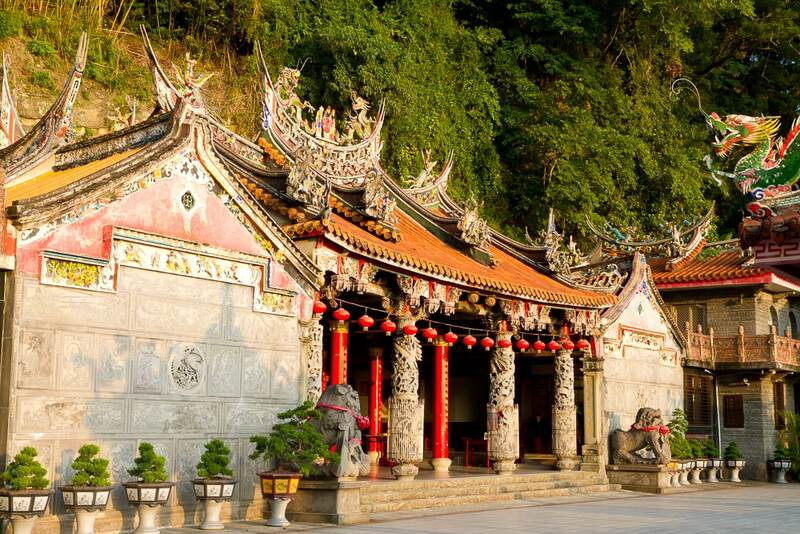 Most of the temples on Lion’s Head Mountain are Buddhist, and many exhibit Japanese influences. 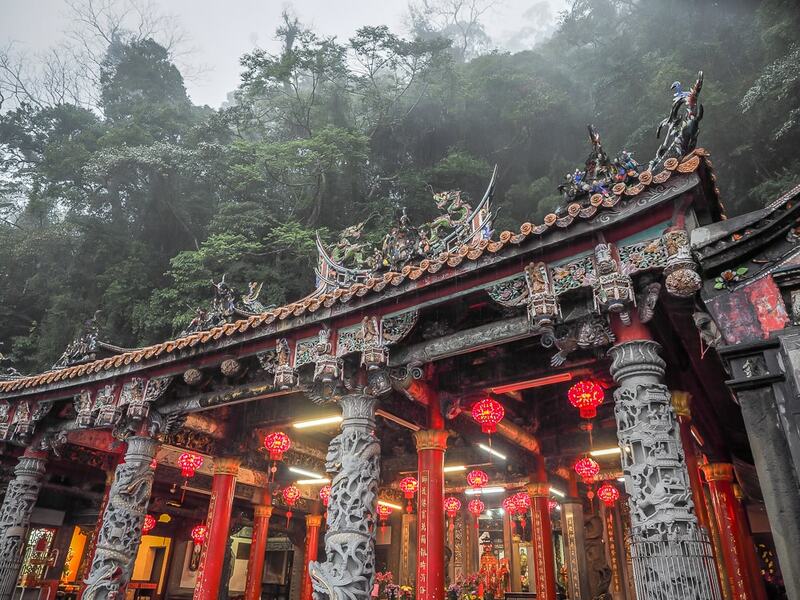 Quanhua Temple and a few others are typical Taiwanese temples in that they combine elements from Taoism, Buddhism, and folk religion. 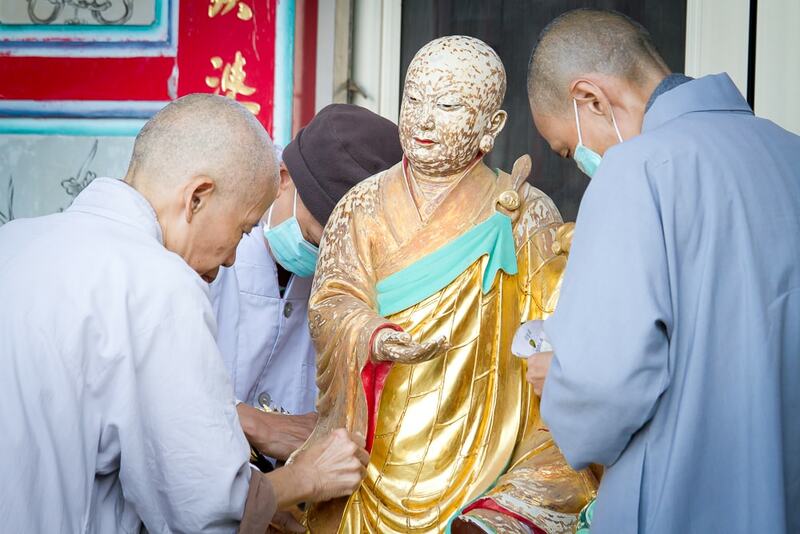 These are active places of worship, and you are likely to see monks and nuns who reside there or hear them chanting. In 1993, Lion’s Head Mountain was designated as a Provincial Scenic Area. The enormous 24,221-hectare zone incudes nearby attractions such as Emei Lake, famous as the site of the enormous Buddhist complex Nature Loving Wonderland, and the Beipu area, known for its Hakka culture, popular Old Street, and cold springs. 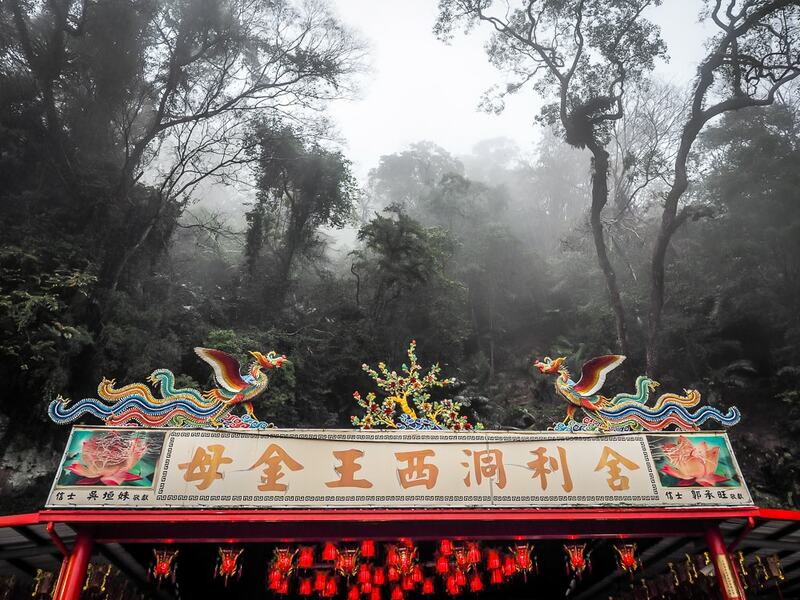 In 2001, the government lumped Lion’s Head Mountain together with Lishan in Taichung and Baguashan in Changhua (the three areas are not even connected) to form the Tri-Mountain National Scenic Area. Thanks to these developments, the mountain’s environment and unique religious culture is protected, the trails are well marked and maintained, and a tourist information center has been constructed on site to provide information to visitors. There are four main interconnected hiking routes on Lion’s Head Mountain, all beginning near the Shitoushan Visitor’s Center on the Hsinchu side. 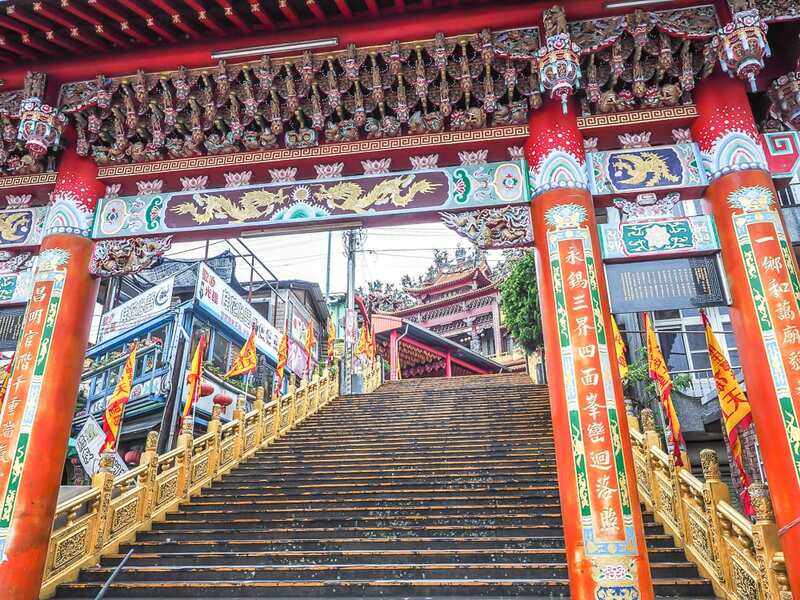 Most visitors hike the Shishan Historic Trail (獅山古道) from the Hsinchu side to Quanhua Temple on the Miaoli side, which takes about 1.5/3 hours (one-way/return), including time to stop and admire the many temples. The trails on Lion’s Head Mountain are well marked and not difficult. They are especially popular with local middle-aged and elderly hikers on weekends, but there are hardly any visitors on weekdays. Simple meals and drinks are served at Xiexin Tea House (歇心茶樓) at the Visitor’s Information Center. 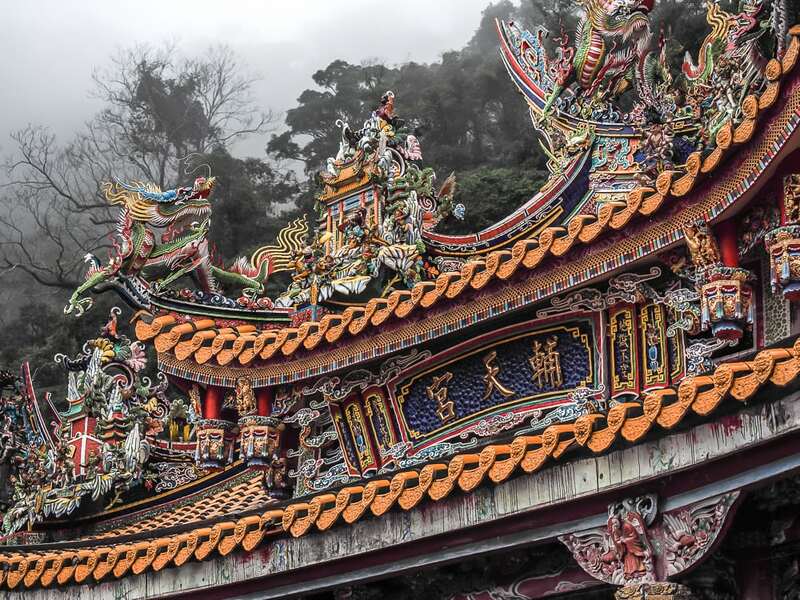 On weekends, vendors set sell drinks and snacks such as dried fruit & nuts at the top of the mountain and stinky tofu around Quanhua Temple. 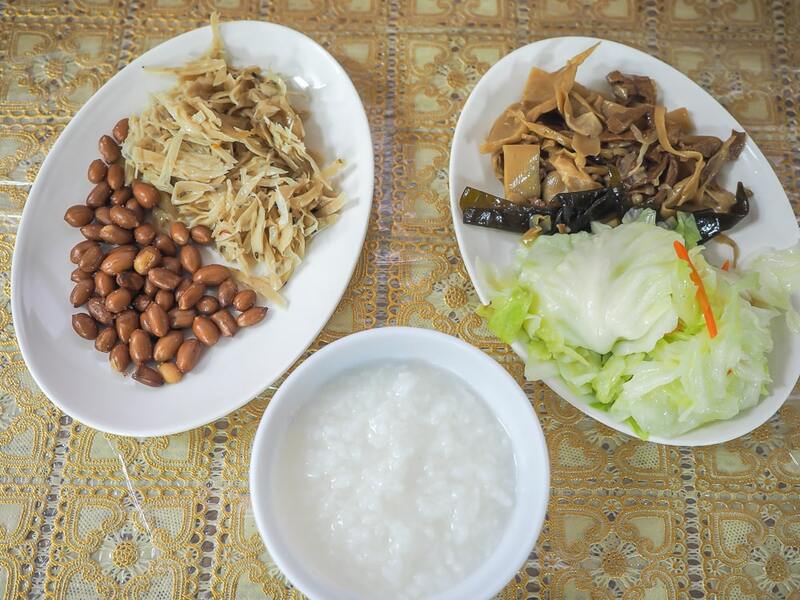 The kitchen at Quanhua Temple, located right beside the main shrine at Futian Temple also serves simple Buddhist vegetarian meals by donation at 6:30 a.m., noon, and 5:30 p.m. Starting a few hundred meters before the Visitor’s Information Center, the Shishan Trail (獅山古道) climbs the Lion’s “tail” (a paved road), soon passing Wanfo (10,000 Buddha) Temple (萬佛庵). 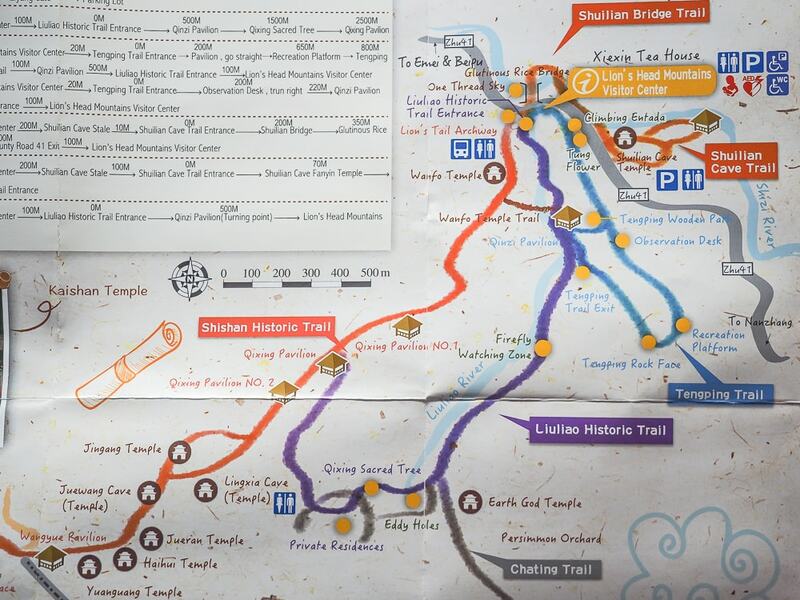 Alternative options for the start of the hike are the Liuliao Historic Trail or Tengping Trail (see below), which take longer but are less crowded and connect to Shishan Trail further up the mountain. 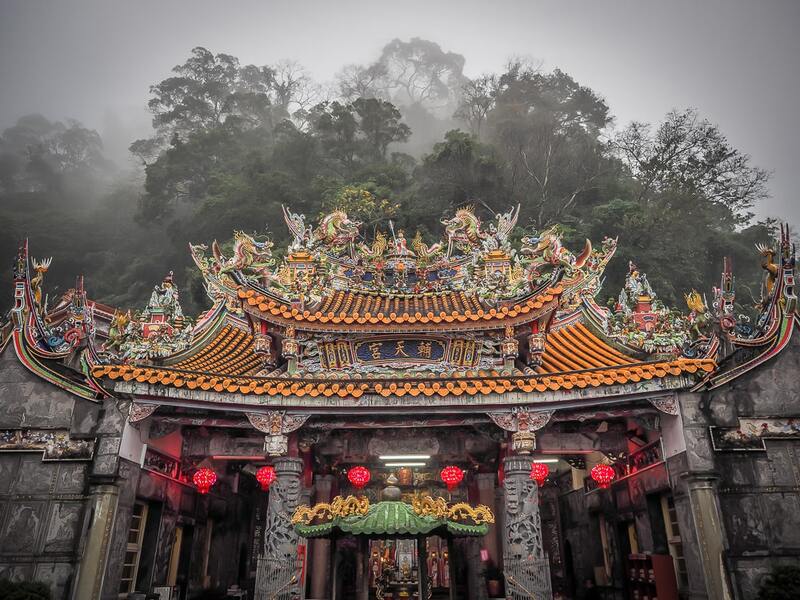 Approaching the top of Lion’s Head Mountain, the trail passes many temples, notably Lingxia Cave Temple (靈霞洞), one of the most famous, and Yuanguang Temple (元光寺), the oldest temple on Lion’s Head Mountain. Nearby, Wangyue Pavillion (望月亭) marks the boundary between Hsinchu and Miaoli counties and the highest point of all the trails. 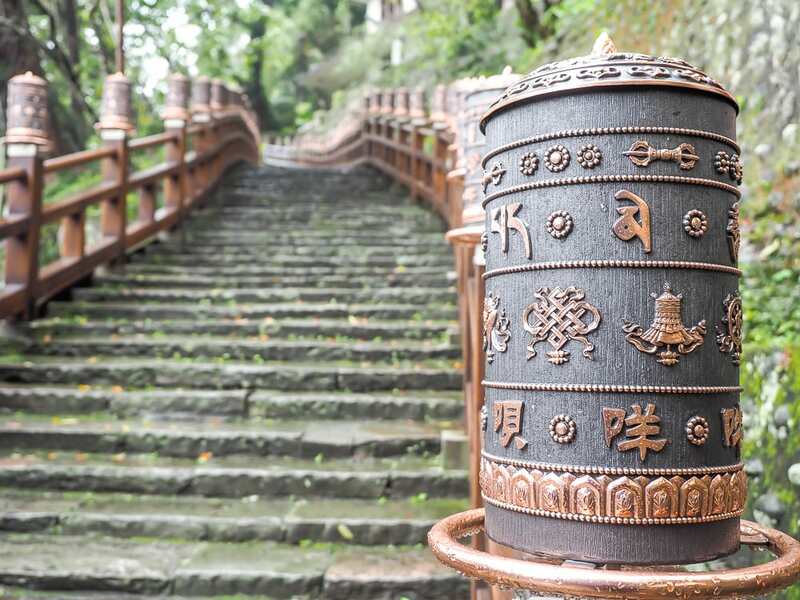 After Yuanguang Temple, the trail descends alongside impressive Shishan Rock Face (獅山大石璧), after which you can go straight to reach Guanri (Sunrise) Pavilion (觀日亭) and two more cave temples, Linyun (凌雲洞) and Sheli (舍利洞). 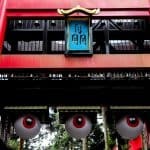 Alternatively, you can hang a left at the bottom of Shishan Rock Face to go directly to Quanhua Temple via Daode Gate (道德門). 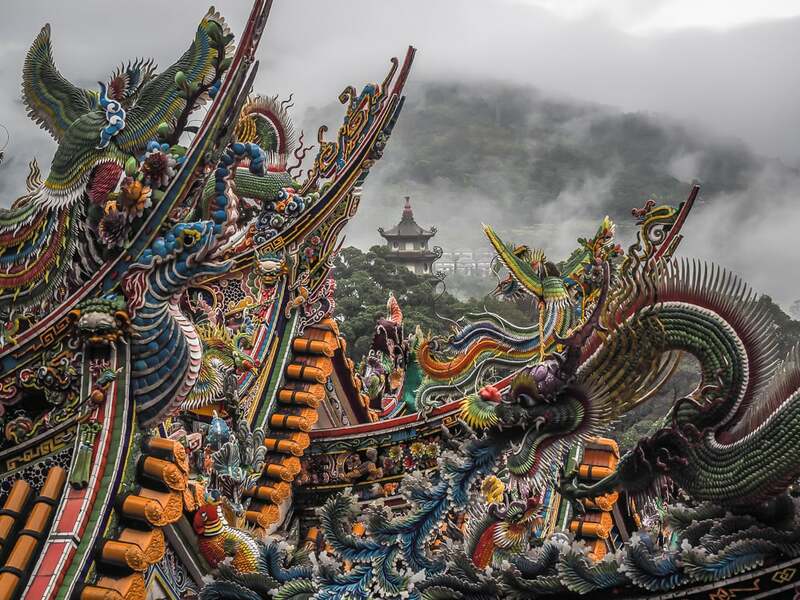 Quanhua Temple (勸化堂), which is connected to Futian Temple (輔天宮), is the most photographed (and arguably most impressive) collection of structures at Lion’s Head Mountain. See below for information on how you can spend the night in this beautiful temple complex. An alternative to the start of the Shishan Trail is Liuliao Trail (六寮古道), which connects to Shishan Trail near the top of the mountain. If you’re coming on the weekend, it can be a way to avoid the crowds. The trail takes a little longer and follows an asphalt road. In April and May, it features many tung blossoms, while at night in the same months you can see fireflies. 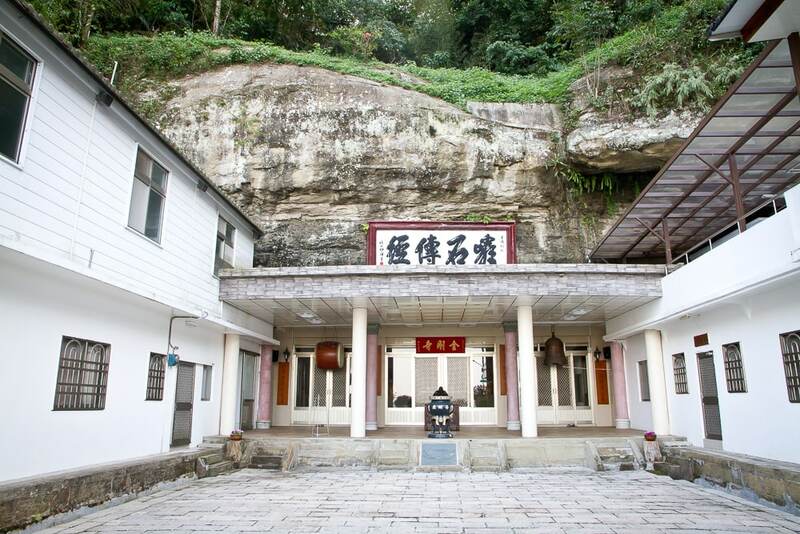 The route passes some tiny Hakka villages and 400-year-old Qixing Sacred Tree (七星神木), worshiped as the Earth god by local Hakka people. Starting right beside the Shitoushan Visitor’s Center, Tengping Trail (藤坪古道) is a shorter, steeper loop that is mostly stairs. The trail is also a good spot to see tung blossoms, and leads to the Tengping Rock Face. Tengping Trail connects to Liuliao Trail, which then connects to the main Shishan Trail. If you are at the Shitoushan Visitor’s Center, you may want to consider the connected trails leading to Shuilian Bridge (水濂橋步道) and Shuilian Cave (水濂橋步道), which are found on the opposite side of the road from the Visitor’s Center and Lion’s Head Mountain. Shuilian bridge is a stone bridge built across the river dating to the Japanese colonial period, while Shuilian Cave is the largest (and lowest altitude) natural grotto on Lion Head Mountain that contains a temple. When we visited on a rainy day, a small waterfall was falling just in front of the temple (you can see the drips in the center of the photo above). 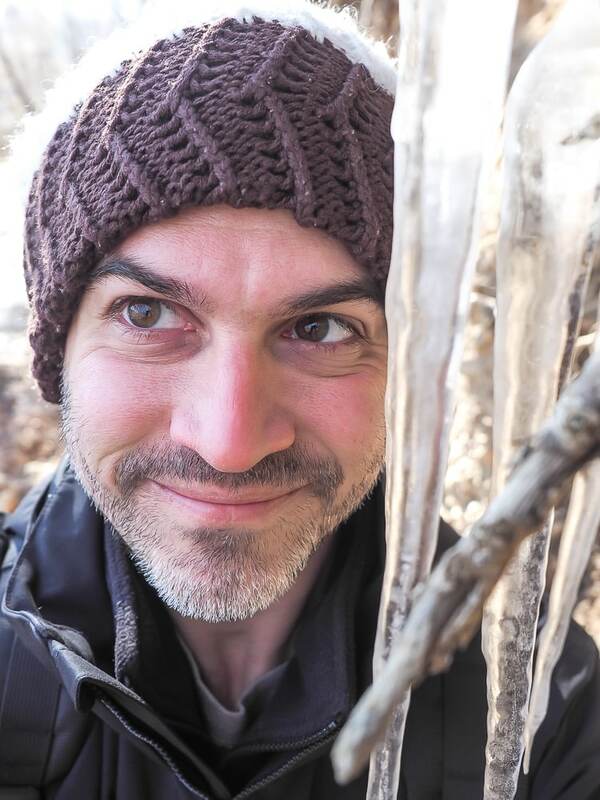 You can easily do these two trails in less than an hour return from the Visitor’s Center. 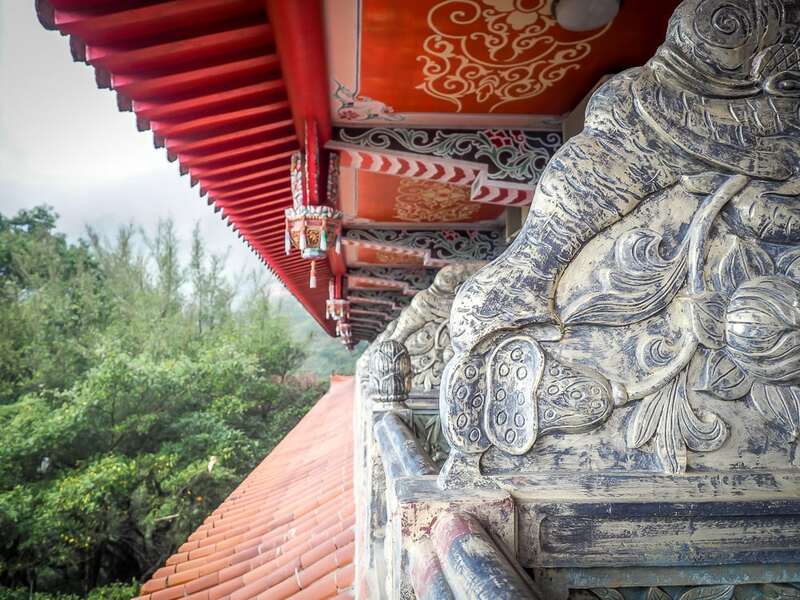 Two out of three times that I’ve been to Lion’s Head Mountain, I’ve stayed in the temple accommodation at Quanhua Temple. 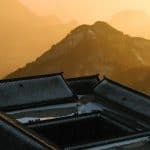 The best part about staying overnight is that you can witness the temples of Lion’s Mountain at their most beautiful: when the sun sets and casts gorgeous light on them, and again in the morning when you wake up and there’s nobody else around. Get rewarded with scenes like this if you spend the night. This isn’t the kind of temple stay where you are subject to ascetic rules or are invited to join in meditations and help clean. 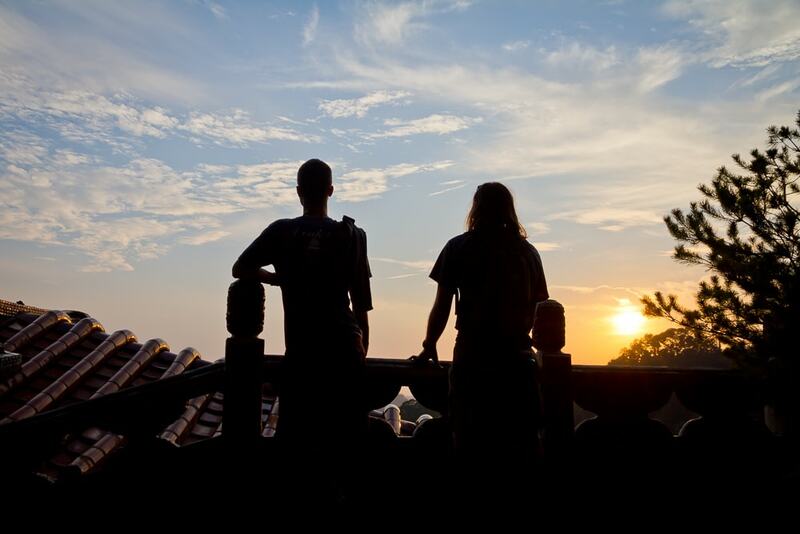 It just feels like a 2-star Taiwanese hotel that happens to be located inside an awesome temple with incredible views. Double rooms cost NT1000 per night and you can make a reservation by calling 037-822020 (unlikely to speak English). There are quite a few rooms there so I can’t imagine it would ever be fully booked. Both times I’ve been, there were only a couple guests in other rooms. It’s not impossible that a large religious group could take up the whole building, but it’s highly unlikely, and you could probably just show up and get a room on any given night. 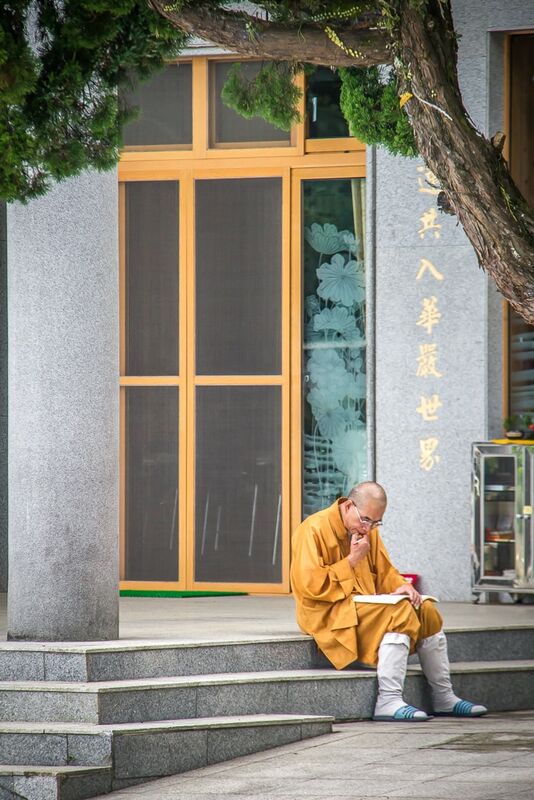 The accommodation and temple kitchen, where Buddhist vegetarian meals are served by donation at 6:30 a.m., noon, and 5:30 p.m., are actually located on the Futian Temple side of the temple complex, right beside the main shrine of Futian Temple, even though they are run by Quanhua Temple. 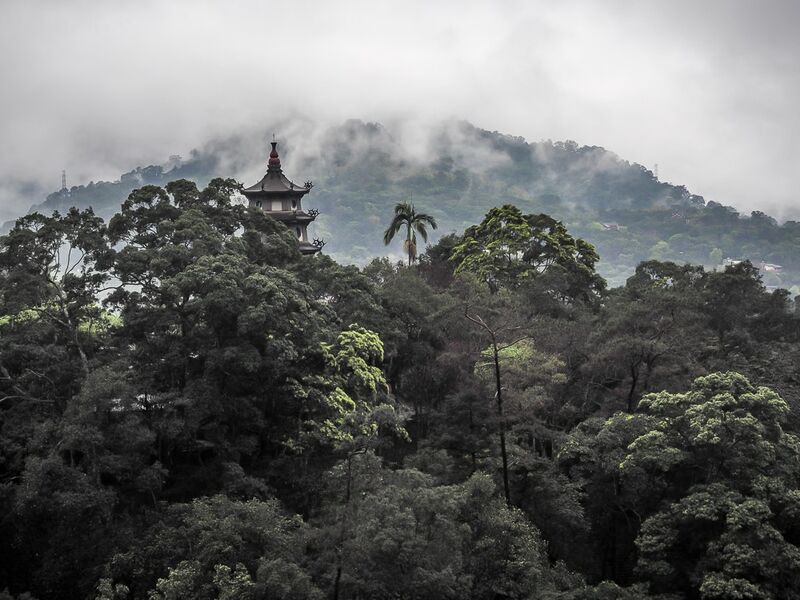 On the morning of our recent (very rainy) stay, we awoke to the incredible view of clouds and mist spilling over the mountains and Quanhua Temple Pagoda (勸化堂寶塔) in front of us. If you’d rather stay in a regular guesthouse in the general area of Lion’s Head Mountain, Bao Kang Flower Farm (read reviews and see prices), Mei Shan Ju (read reviews / see prices), and Rainbow Spring Yu B&B (read reviews and see prices) are three options that we seriously considered when we were planning our trip, all located between Lion’s Head Mountain and Nanzhuang. 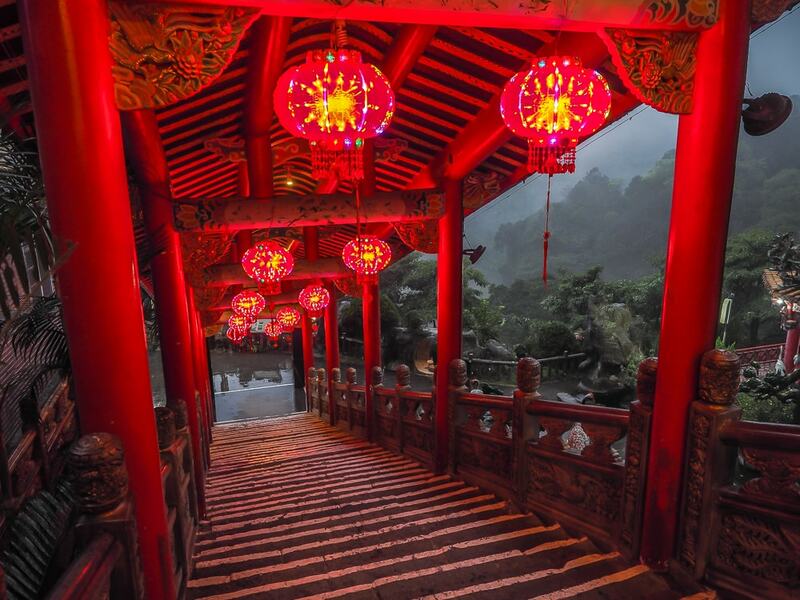 The small Hakka village of Nanzhuang is another popular attraction in the Lion’s Head Mountain area. 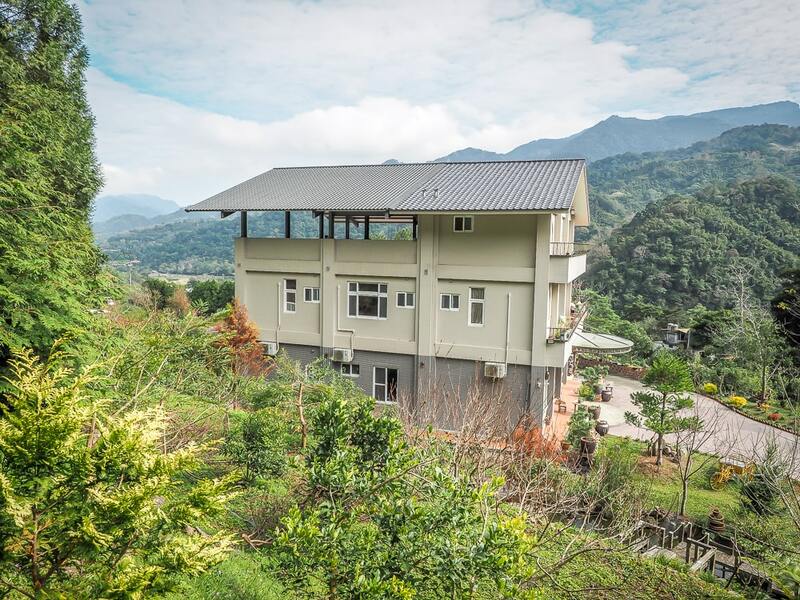 The township has developed a reputation in Taiwan as a chilled out “slow travel” destination, and there are numerous minsu (guesthouses and B&Bs) in the area. 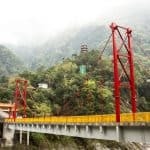 Another popular thing to do in Nanzhuang is walk across the Kangji Suspension Bridge, found at the southern end of town by the bus station, Sweet Osmanthus Alley, and the Visitor’s Center. 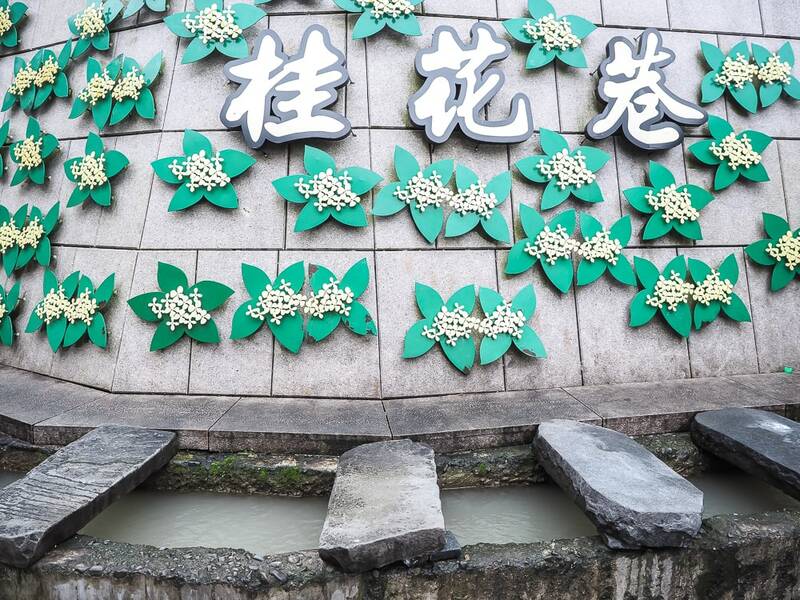 For most visitors, the main reason to come to Nanzhuang village is to go for a stroll and enjoy some local delicacies on Sweet Osmanthus Lane (桂花巷). The old street’s namesake is a small but very fragrant flower that is grown in the area and is used to flavor all kinds of foods and drinks, especially honey. The best place to try sweet osmanthus-flavored honey is at Jiangji Sweet Osmanthus Tang Yuan (江記桂花湯圓), roughly in the center of the alley. 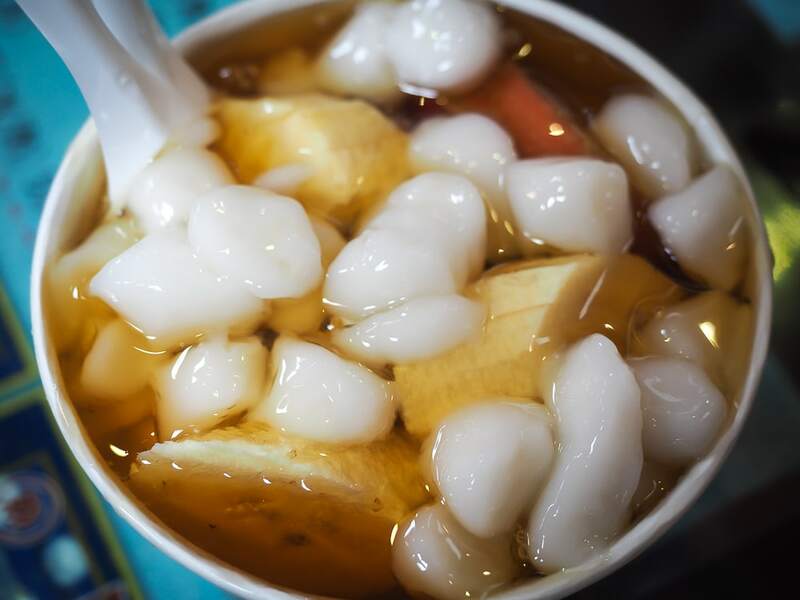 Their signature treat is a bowl of shaved ice topped with banana, apple and watermelon (the latter when it season, late spring to summer) and a generous layer of sweet-osmanthus honey. I also enjoyed the sweet potato and taro Hakka mocha round cakes at Qiu Family Handmade Hakka Mochi (邱家手工客家麻糬) on the other side of the alley, while my kids loved the liang gao (涼糕), chunks of colored jelly cakes. 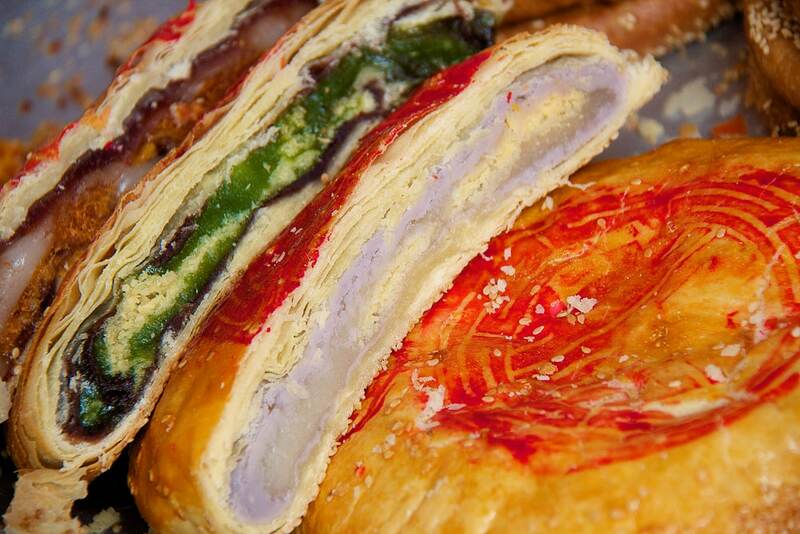 Other popular treats on the alley include mochi, black sugar cake (黑糖糕), and yu guo qiao (芋粿巧 or cakes of steamed taro and dried mushrooms). 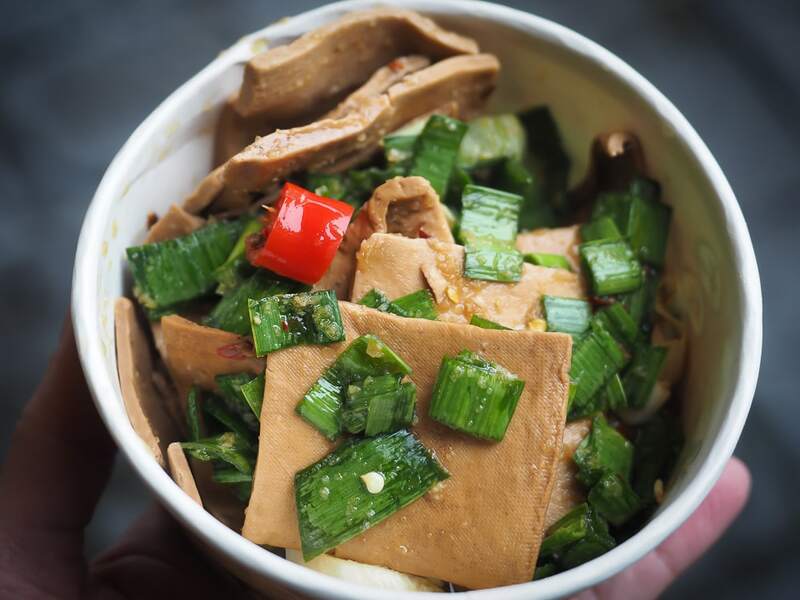 You also pretty much have to (it’s a rule) stop at Mother-in-Law Dried Tofu (丈母娘豆干 or Zhangmuniang Dougan). Their freshly made dou gan doused in soy sauce, garlic, chilies, and scallions is worth waiting in line, and we really liked the packaged spicy dougan we bought from them to take home. There’s one location at the northern end of Sweet Osmanthus Alley, and another at the bottom of the stairs leading to Yongchang Temple. 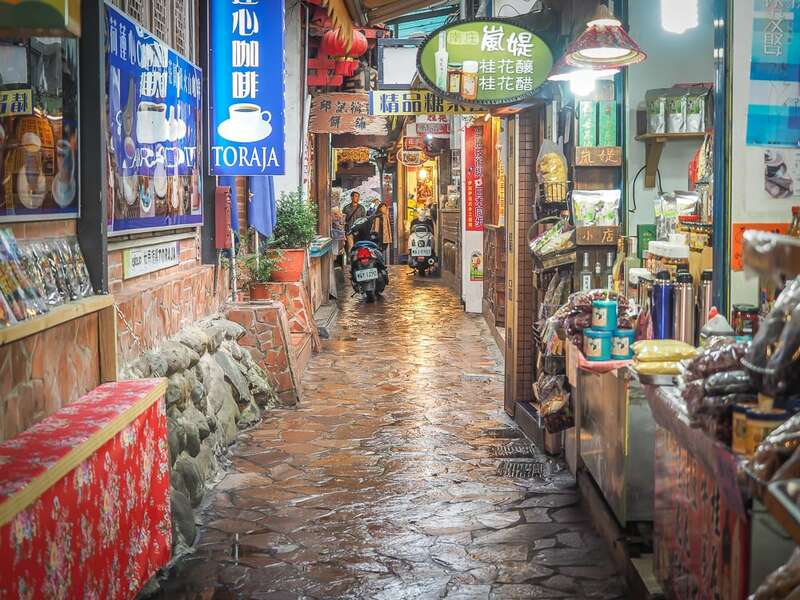 Sweet Osmanthus Alley is actually quite short, but its one of our favorite old streets in Taiwan because it is quite atmospheric, and when we visited on a very quiet, rainy weekday we found the vendors there to be especially warm and welcoming, even by Taiwanese standards. Be warned that on regular weekends, the tiny narrow allow can be truly packed! 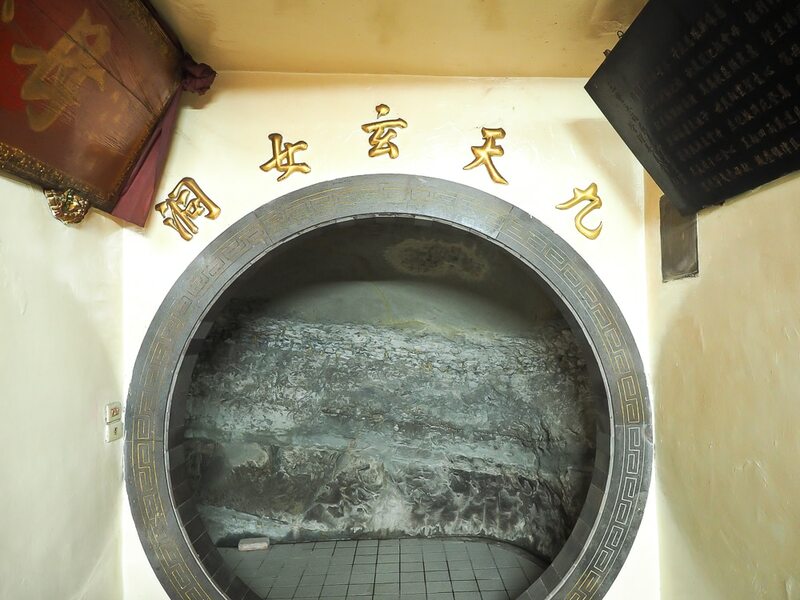 At the southern entrance to the alley, there is an atypical attraction called Xishankeng (洗衫坑), a canal lined with stone plates where locals have gone to wash laundry and produce for decades. At the northern end of the alley, a set of stairs leads up to Yongchang Temple. At the bottom of the stairs you’ll find a collection of sit down restaurants serving typical Hakka fare like ban tiao (wide rice noodles), tang yuan soups, local greens, hearty stews, and more. There are several more shops, restaurants, and food stalls along Zhongzheng Road, which runs parallel to Sweet Osmanthus Alley. You can also find handmade clothing shops that sell really cute kids’ robes and clothing with traditional Hakka and Chinese motifs. On our recent trip, we stayed at an exceptional guesthouse just across the vehicle bridge south of town called Heaven Bird B&B (read reviews / see prices). The owner was super friendly, the room was huge and spotless, and beds were extremely comfortable. 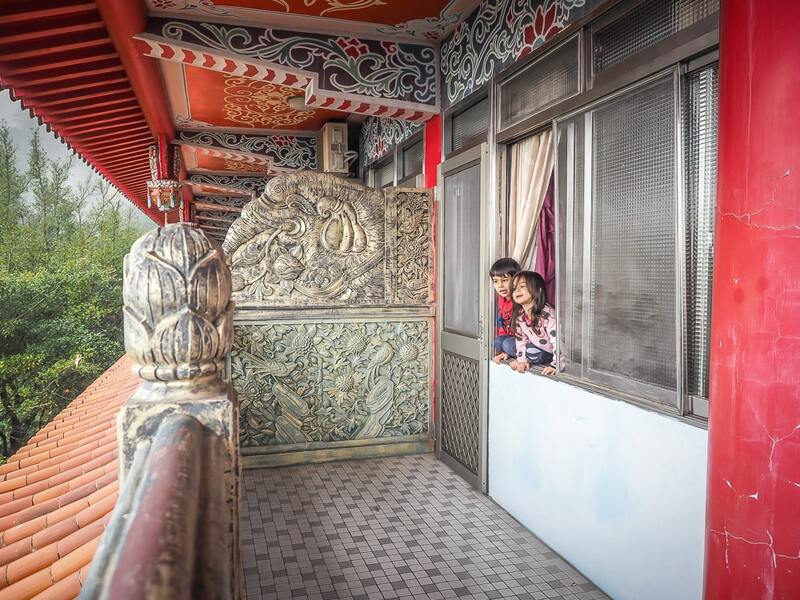 We booked the best room in the house, the family room, which felt very secluded with its own entrance staircase and huge windows and private balcony overlooking a lovely garden and bamboo forest. My son and I both agreed that we would love to have a home like that someday! 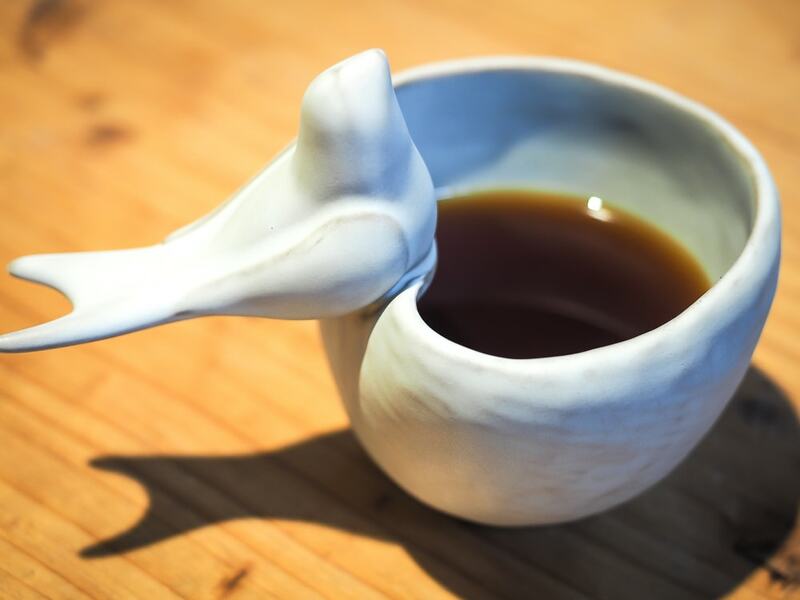 Another guesthouse in the Nanzhuang area that I recommend is Yanzitao Pottery Coffee B&B 燕子陶 (read reviews / see prices) which I wrote this article about for Travel in Taiwan magazine. 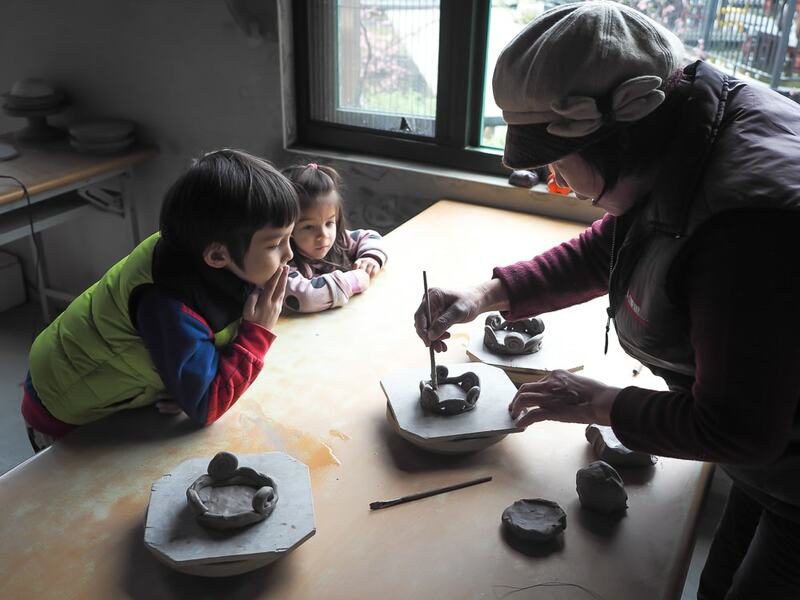 Run by a retired Hakka couple, the wife is a well-known potter who now teaches pottery classes on site for kids or adults. She will even mail your finished work out to you after they dry and fire it in the huge kiln on site, while their daughter Momo makes exceptional slow drip coffee, including Taiwanese roasts and flavored coffees such as turmeric and maqaw, a lemony peppercorn-like ingredient common in indigenous Taiwanese cuisine. 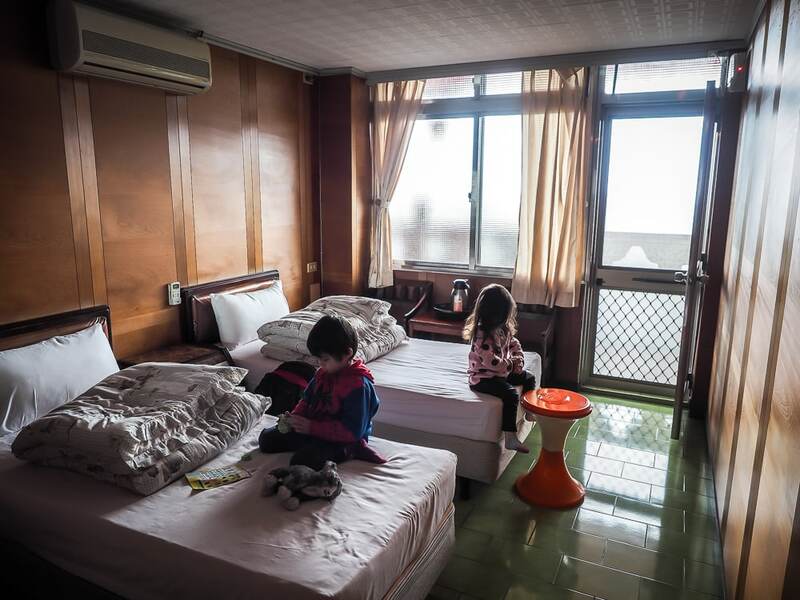 The guesthouse bills itself as the kind of place to experience Nanzhuang’s characteristic slow living. You can wander their gardens, where they grow coffee beans, tung blossoms, and more, or even camp beside their swimming pool! 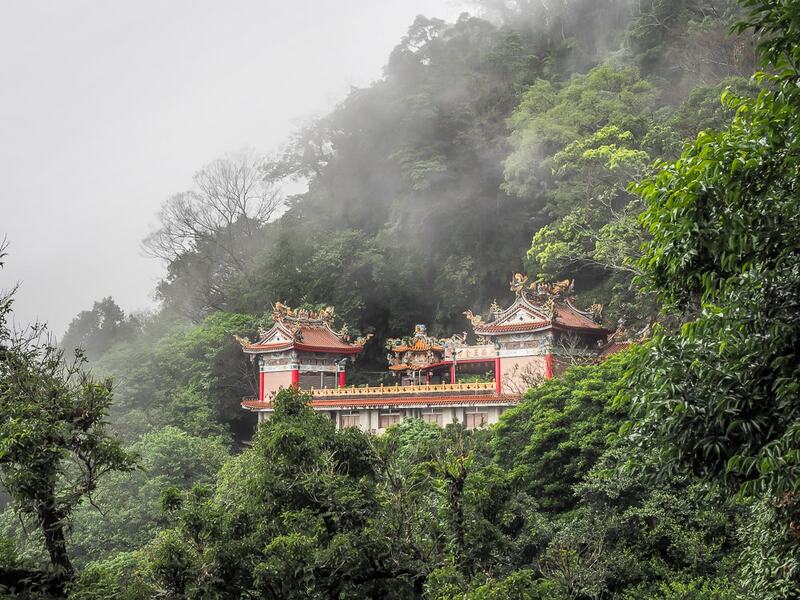 Getting from Taipei to Lion’s Head Mountain can be a little tricky. Currently, only bus 5700 runs to the Shitoushan (Lion’s Head) Visitor Information Center on the Hsinchu side of the mountain, starting at Zhubei train station and passing Hsinchu HSR station on the way. If you arrive by HSR, make sure to book your HSR tickets online to get a 20% discount. The shuttle bus can be quite packed on weekends. There used to be a small shuttle connecting the Hsinchu side of the mountain to the Miaoli side, as well as a bus from Lion’s Head Mountain to Nanzhuang, but neither one of them is currently running. When we spoke to the Lion’s Head Visitor Information Center, they said the government is between contracts with private bus companies, and it is uncertain whether these buses will be continued again in the future. From the Miaoli side of Lion’s Head Mountain, you could actually walk to Nanzhuang (3.5 kilometers, about one hour), from where there are bus connections. All the buses from Hsinchu or Miaoli to Nanzhuang actually pass somewhat close to the entrance of Lion’s Head Mountain, so if you want to start on that side, you could get off the bus and then hike up from the highway (about 30 minutes uphill). 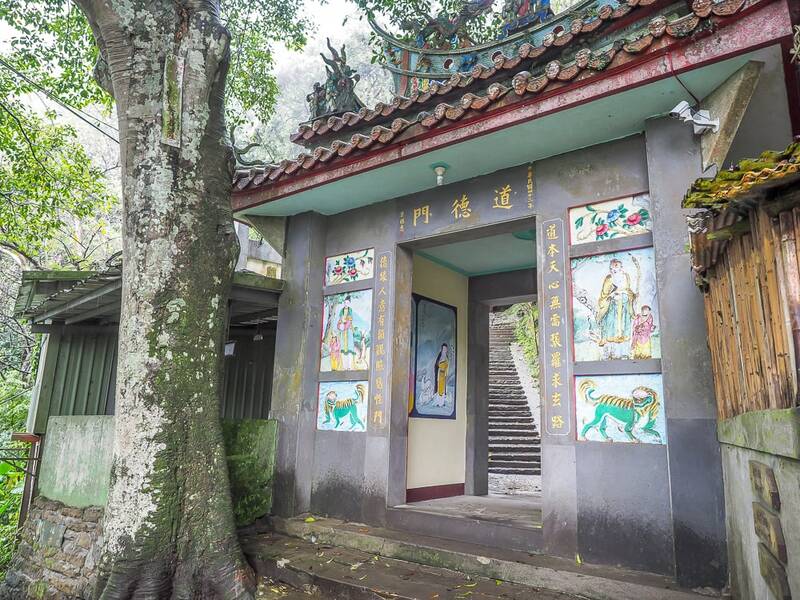 You can hike up the vehicle road to Quanhua Temple, or walk further from Nanzhuang along the highway to find a trail that goes up through the forest. The best way to get to Lion’s Head Mountain is by scooter. Every time I’ve ever gone, I’ve taken the Kuokuang bus from Taipei (or Banqiao) to Zhudong (竹東) bus station (Zhudong also has a train station, but only serving the Neiwan line), then rented a scooter from a small shop in Zhudong called 勝東機車行 (03 595 7358, license required). It only takes about 30 minutes to reach Lion’s Head Mountain. 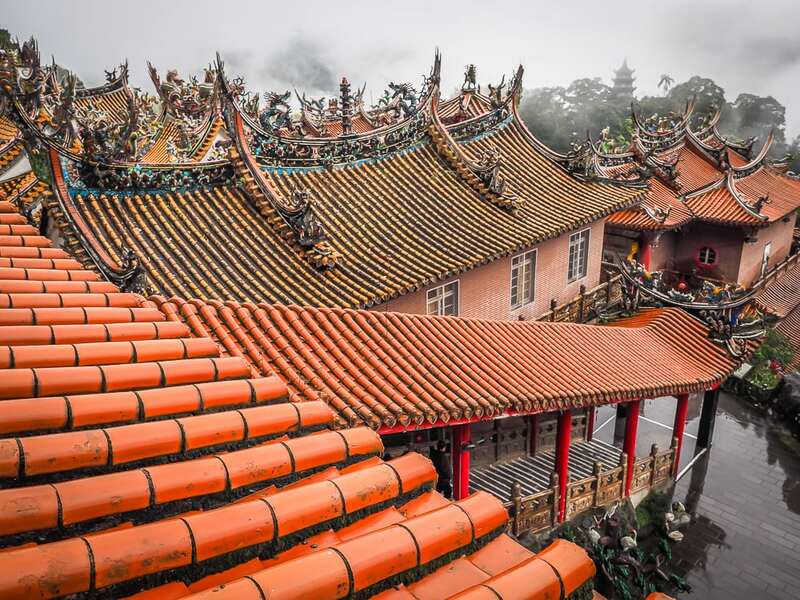 The scenic drive from Zhudong to Lion’s Head Mountain passes the Hakka village of Beipu, where you can stop for lunch on the famous Beipu Old Street, and (if you stay on Highway 3), you can also pass the enormous Buddhist complex Nature Loving Wonderland in Emei, featuring the world’s largest standing statue of Milefo, the laughing Buddha. The faster and more direct route involves turning off of highway 3 onto along Shishan Road (獅山道路) before reaching Emei. 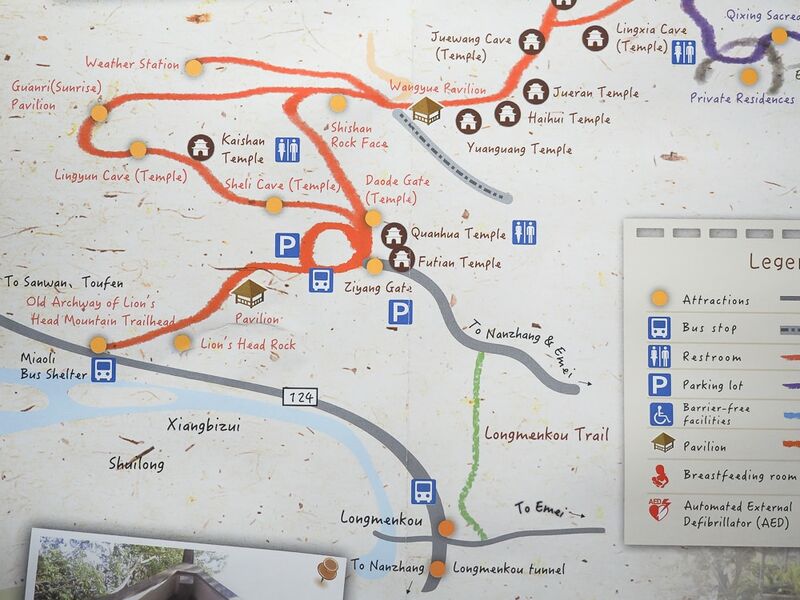 This route brings you to the Hsinchu side of Lion’s Head Mountain, but also continues on to the Miaoli side. Again, riding a scooter in this area is best, but on public transportation you can reach Nanzhuang on bus 5804, 5805, or 5806 from Zhunan or Toufen (both with connections to Taipei). As mentioned above, you could get off one of these buses and walk about 30 minutes to reach the Miaoli side of Lion’s Head Mountain, or walk from Lion’s Head Mountain to Nanzhuang (3.5km) in about one hour.